Content intelligence (CI) is the shiny new toy of content marketing. Like many new technologies, some users may try to adopt content intelligence technology before they fully understand it, and fail to fully realize its benefits. Content intelligence software is expanding in variety and function, so it’s important to understand the pain points content intelligence addresses. This post offers a brief overview of what content intelligence is. It addresses some of the pain points content intelligence solves, and outlines the first step to prepare for the advent of this exciting technology. First, let’s define content intelligence. Content intelligence draws upon artificial intelligence (AI) and big data, but it is neither of those things. Content intelligence is the systems and software that transforms data into actionable insights for content strategy and tactics. Content intelligence gives you the full context of an individual piece of content—and the body of content it sits within, to make better decisions about anything pertaining to the content in question. What Pain Points Does Content Intelligence Address? Every marketer alive today proclaims how “data-driven” they are. But if you look at how content is utilized, it’s still mostly based on intuition and guesswork. Only eight percent of marketers consider themselves “very successful” or “extremely successful” at tracking content marketing ROI (LinkedIn Technology Marketing Community), and only 55 percent of bloggers regularly check analytics (Orbit Media). 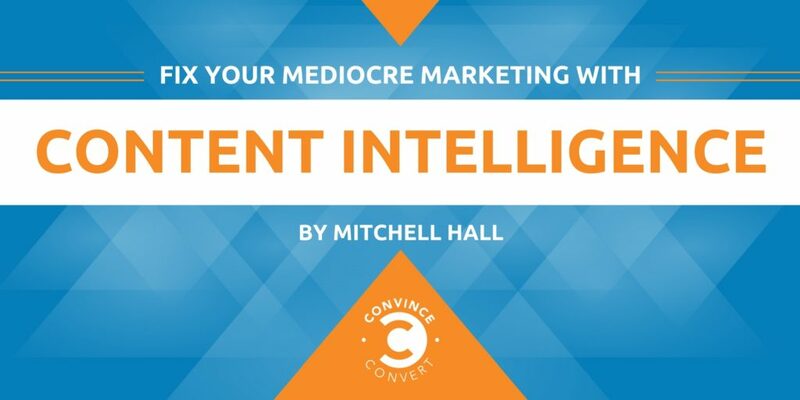 Here are five common content marketing pain points that content intelligence addresses. When it comes to content marketing, creating a killer piece of content is only half the battle. In addition to creating engaging content, your audience needs to be exposed to it. This means building a successful distribution strategy around your content beyond just a cursory social share or email blast. Currently, there are many channels where most decisions about how to utilize content largely come down to intuition. These include social media, websites, advertisements, and so on. Content intelligence can add significant value to this process by utilizing consumer models and characterizing content from previous interactions to suggest what to share next. It can make those decisions informed, and even automate some of those decisions in a scalable manner. Think about how hard it is to know what to promote, when to promote, and where to promote it. Over four million blog posts are published on the internet every day, while 50 percent of content created gets eight shares or less according to BuzzSumo. Content intelligence will enable highly personalized, cross-channel promotion that humans are just not wired to do. When trying to find a show to watch on Netflix or songs to listen to on Spotify, you’re served personalized media based on your viewing history and personal taste. Yet on a company’s web page, you’re usually presented with the same stories everyone sees. With content intelligence, expect instead to see stories based on your previous browsing history, your position in an organization’s hierarchy, your title, what you’ve consumed in the past, what other people in your organization have consumed in the past, and even which content—or certain pieces of content, shared in succession—has the highest conversion rate at the stage you’re currently at in the consumption cycle. Those are just a few factors content intelligence can weigh when calculating which content to display to a given consumer. But there are literally hundreds of possible factors that can be fed into an algorithm to find the right weight for all those inputs, so you know exactly what context something has and what the right piece of content is. This could be hugely impactful in making your content work harder for you. According to Infosys, 74 percent of customers feel frustrated when website content is not personalized, and Rapt Media says 63 percent of consumers said they’d think more positively of a brand if it gave them content that was more valuable, interesting, or relevant. Content intelligence will utilize your existing content inventory to make it as effective as possible. Content marketers can use their inventory more effectively if they know when to refresh evergreen articles or update other content to help it perform better. Say a particular article or blog post performed really well, but it hasn’t been refreshed in a year. Wouldn’t it be nice to receive a prompt for this article to be refreshed and shared? Beyond that, content intelligence could recommend changing a headline or adding more images if it recognizes your existing content could work more efficiently for you. There’s a constant stream of things a content marketer can do to be a lot more effective that don’t take up much time, but it’s hard to figure out what they are. Content intelligence can surface that information in an easy-to-understand and easy-to-act-on way, so you can login every day (or week), get some really useful feedback or advice, make those changes, and see specific growth in certain areas. Content intelligence will allow you to do this throughout funnel stages, your website, a sales person on the phone, or emailing with a prospect. Any time you have a touch point with a customer, you can show targeted information that’s highly valuable to them. Writer’s block has been giving content creators ulcers since before content marketing existed. Content creation is another area content intelligence can optimize. Content intelligence can make recommendations about what to create based on what performs well, or what your competitors are doing, and the recommendations can vary based on your goals. You could say, “We have a goal of a certain number of leads or page views generated for this quarter,” and you could receive recommendations to help you achieve that. The recommendations will necessarily differ based on the goal. While machines can mainly only create data-driven content for now, that’s evolving quickly. IBM partnered with a movie studio and created a video trailer using AI, which took over the creative process. Coca-Cola has used AI to generate TV ads, selecting the music and creating scenes. Tennessee-based marketing strategist, speaker, and author Mark Schaefer coined the term “content shock” in 2014. It describes the phenomenon of an ever-increasing arms race to produce more, and more compelling, content. This content is seldom personalized, and consumers’ attention spans are resolutely finite. These two things together ultimately overwhelm people with content options, making content marketing less effective for most companies. Content intelligence is a significant competitive advantage for organizations wanting to overcome content shock. Content intelligence offers insights that help you produce better, more engaging content. It also offers more intelligent means of distribution to get content to the right audience where it’s most compelling. Content intelligence enables you to present the right content to the right person, every time. For example, if you’re a B2B marketer and have just downloaded an ebook, often you’ll be presented with that same ebook as a call-to-action if you revisit the site two days later. If that company has created enough great content, however, content intelligence allows them to truly tailor their brand experience to an individual level. You don’t feel there are too many products on Amazon because you only see the stuff that matters to you, based on your behavior. If content is the same way—if you only see what’s relevant to you all the time—it doesn’t matter to you how many millions of ebooks are out there. Content intelligence relies primarily on data computation to work. This means the insights it provides are only as good as the amount and quality of the data you have. To leverage this technology for competitive advantage requires as long a history as possible of well-structured, well-maintained, trustworthy data. The first step to ensuring you have good data is to conduct a comprehensive content audit (which should be performed once a year, regardless) and implement an organized tagging and categorization system for all your content. Content intelligence can solve a wide range of content marketing problems. These include alleviating time constraints, resource shortages, strategy uncertainty, stresses around data computation, and content recommendations. For a more in-depth look at content intelligence check out Content Intelligence: The New Frontier of Content Marketing Technology.